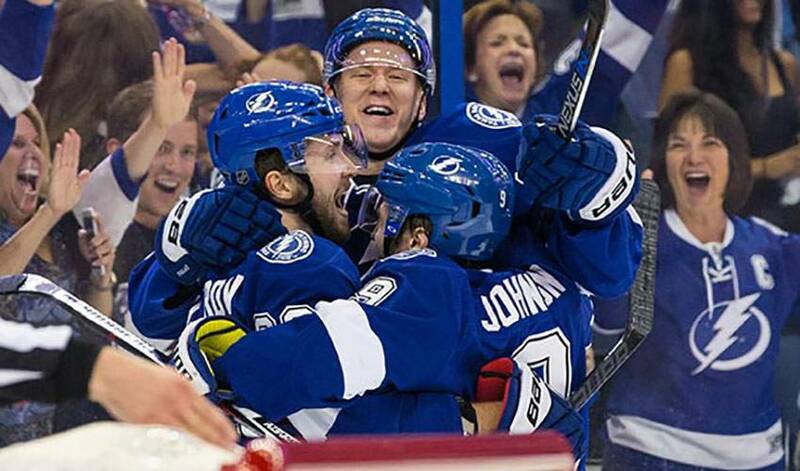 Nikita Kucherov helped paced Tampa Bay to a 4-1 series clinching victory in Game 6 of their series against Montreal. The Lightning now moves on to the Eastern Conference final, where they await the winner of the Capitals and Rangers, who square off in Game 7 on Wednesday night in New York. The 21-year-old winger had two goals and one assist in the Bolts Game 6 win. After 13 playoff games this year, Kucherov has six goals and 11 assists. These totals put him near the top of the playoff scoring chart, as he is currently ranked fourth in goals, fifth in points, second in power-play goals (three) and second in game-winning goals (two). STAT PACK: Kucherov fired three shots in 14:21 of ice time, taking 24 shifts. NEED TO KNOW: Kucherov’s mother took him along when she went on a job search, where she found employment at a Russian hockey rink. It sparked his interest in the game and put him on the path to an NHL career. NO TIME TO WASTE: On November 25, 2013, Kucherov scored his first NHL goal, with his first shot, on his first shift, against the New York Rangers. He became the seventh Lightning player to score in his big-league debut. PILING UP THE POINTS: He represented Team Russia at the 2011 Under-18 World Championships, recording 21 points in seven games to help lead his team to a bronze medal. Kucherov was named the Best Forward – his 11 goals and 21 points led the tournament. JOIN THE CLUB: Kucherov is the second player in franchise history to have three points in a series-clinching victory. He joins Fredrik Modin, who recorded three assists on April 16, 2004, in Game 5 of the Eastern quarterfinals against the New York Islanders. JOIN THE CLUB, PART 2: All six of Kucherov's goals these playoffs were scored in the second round versus Montreal, matching a Lightning single-series franchise record. Teammate Tyler Johnson scored six goals in the first round against Detroit and Ruslan Fedotenko scored six in 2004 versus the Philadelphia Flyers. A TIP OF THE HAT: On October 28, 2014, Kucherov netted his first career NHL hat trick against the Arizona Coyotes. HONOURABLE MENTIONS: Steven Stamkos and Ondrej Palat each had one goal in Tampa’s win. Ben Bishop made 18 saves in the Lightning’s victory. Tyler Johnson had a plus-two rating. Anton Stralman played a team-high 23:41.